Trinity Designs: So Grateful For You! 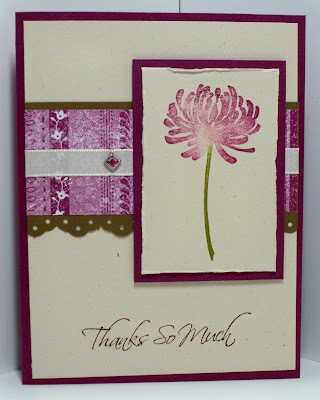 This post is all about YOU - thank you for making my Stampin' Up! business a success for another year. I have said it before, and I'll say it again, I have the best clients, friends and team members in the world and I am so very appreciative for each of you. Yesterday ended the Stampin' Up! fiscal year and I'd like to share a few of the highlights that happened for me and my family because of YOU and Stampin' Up! My car was paid off! Mark and I were able to travel to Hawaii - all expenses paid! Emma's team skating expenses were paid! I was honored to be named in the Top 100 Demonstrators in the US! I was also honored to be in the Top 10 in Recruiting in the US! We, as a family, will be on the Southern Caribbean Cruise next May - all expenses paid! Most importantly, I was once again able to put my family first and still be able to provide an income. Many times, especially over the last year, Mark and I have discussed me going back to "work" outside our home. But we feel that 'home' is where God wants me to be and He has so faithfully provided for us through YOU and my Stampin' Up! business. I truly love what I do, but what I love the most is the relationships that have been built because of stamping. Most of you I never would have met without the connection of a little rubber stamp. The bond of shared creativity, laughter and chocolate is wonderful and I am so happy to have you in my life! So, now we have a NEW year to look forward to - new creations, new fun and new goals. Happy NEW YEAR everyone! I am excited to continue to serve you as your Stampin' Up! demonstrator and friend. Let's make it an amazing year, shall we? the winner is........... Jan Jeffreys! WooHoo! Congratulations Jan! You now have $50 to spend in the New Idea Book and Catalog this month! Now comes the hard part, what to choose! Jan, please leave a comment on this post so I know you are the winner! The card I've created today showcases some of the new In Colors and Designer Series Paper along with a new Hostess Stamp Set - Kind and Caring Thoughts. Here is the supply list for you. I've italicized the NEW items. It's important to note that ONLINE ORDERING from the new catalog goes LIVE at NOON mountain time (that's 2 pm for East Coast). There is a great new promotion that Stampin' Up! is offering through the month of July - it's called the Deal of the Week! It's a special item that will be on SALE for one week only each week of July. The first item begins today when ordering goes live and will be available through July 6th at 11:50 PM est. So........if you've ever wanted the Scallop Border Punch, NOW is the time to order it! Regular Price is $15.95 - Deal of the Week price is just $10.95! You can either contact me to place your order or do it online via my website! I have a lot more fun announcements to make to you, but nothing that can't wait until I get back from our short vacation this week. While I am gone, I've scheduled some posts for you - a few cards from a New Catalog Swap I just hosted, plus Blogger's Challenge and Stamping 411's Saturday Sketch Challenge! Have a great Wednesday everyone and Thanks SO Much for everything! This card is stunning and one of my favorites from the swap you hosted.. just gorgeous! OH MY GOODNESS!! I am so excited!! Thank you so much!! Congratulations on the accomplishments the Lord has given this past year. May next year prove to be even better. Now I must go and spend time looking at the new catty. that really is a nice card, Robin! Love the chocolate and raspberry color combination (yum) and the clean design!